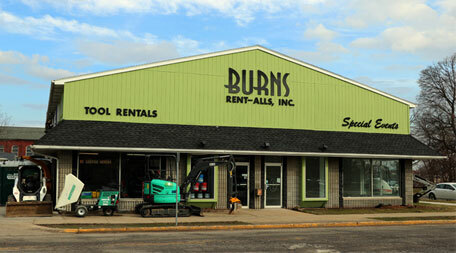 Serving the South Bend-Mishawaka Metro Area for over 100 years, Burns Rent-Alls has been offering an extensive selection of tool and equipment rentals for contractors or homeowners alike. Whether you are renting a tractor or a floor sander, a generator or a compactor, our years of experience enable us to help you select the right rental equipment for your job. We believe in a team effort, and are confident that great customer service and a friendly atmosphere will be your experience when you use our services. We offer you our best at a reasonable price! Looking for the finest equipment rentals and tool rentals at reasonable prices? Large to small, we have it all! Our equipment and tools are ready to rent when you are. At Burns Rent-Alls, we carry retail items and contractor supplies, including a wide selection of automotive supplies, construction supplies, power tool supplies, and janitorial/floor cleaning supplies. We offer a great selection of portable toilet rentals for virtually any occasion or any size event. Call us today for all quality toilet rental & cleaning service in the South Bend-Mishawaka Metro Area. Burns Rent-Alls offers an extensive selection of event & party rentals to make your special event a hit! Please visit our event/party rental website to browse our online catalog.